The TTABlog®: TTAB Test: Is "S-LON" Confusable With "C-LON" for Thread? 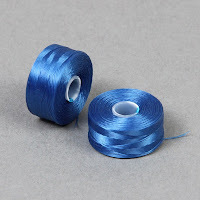 TTAB Test: Is "S-LON" Confusable With "C-LON" for Thread? The USPTO refused registration of the mark S-LON for "yarns and threads for use in making beaded jewelry," finding the mark likely to cause confusion with the registered mark C-LON for "threads made of nylon." The goods overlap, but are the marks too close? How do you think this appeal came out? In re M & Y Trading, Serial No. 86879006 (March 14, 2018) [not precedential] (Opinion by Judge Susan J. Hightower). Applicant agreed that its identification of goods encompasses nylon thread. The Board must presume that these overlapping goods travel through the same, normal channels of trade to the same classes of consumers. As to the marks, applicant contended that each mark contains only “one letter with source identifying capacity” and that the different initial letters S and C sufficiently distinguish the marks in appearance, sound and pronunciation, connotation, and commercial impression. The Board did not agree. As for connotation and overall commercial impression, there was no evidence to support applicant' assertion that the element "–LON" conveys to consumers that the threads in question are made of nylon. Even if it did, "this shared significance serves to heighten the similarity in meaning between the marks." We are mindful that because the marks would appear on goods that are overlapping and legally identical, the degree of similarity necessary to support a conclusion of likely confusion declines. See Viterra, 101 USPQ2d at 1908; In re Bay State Brewing Co., 117 USPQ2d 1958, 1960 (TTAB 2016). We find the marks in their entireties to be highly similar in appearance, sound, connotation and commercial impression. The first du Pont factor thus weighs heavily in favor of a finding that confusion is likely. Applicant argued that consumers engaged in handcrafts are particular about the materials that they use in fabricating their craft products and are careful in their purchasing decisions. The Board, however, found no supporting evidence in the record. In fact, registrant's C-LON threads are sold for as little as two dollars, and thus "may be subject to impulse purchase, including by consumers new to beaded jewelrymaking." The Board is required to make its decision based on the least sophisticated potential purchasers. In any event, even sophisticated purchasers “are not immune from source confusion where similar marks are used in connection with related [goods or] services." The Board therefore affirmed the Section 2(d) refusal. TTABlog comment: Do you agree with the decision?